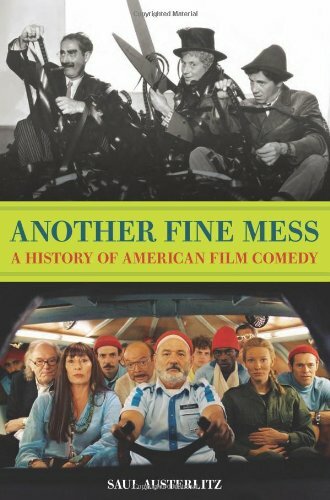 Order Another Fine Mess: A History of American Film Comedy by Saul Austerlitz, available in print or ebook from Amazon.com by clicking on the book cover above! Image via WikipediaIf it’s a choice between watching drama or comedy, I always pick comedy.Why choose to get all weepy and sad when the other option is to fall off your chair laughing? 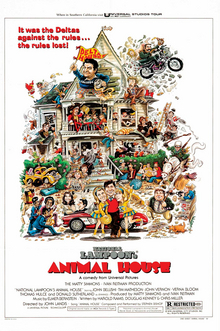 I think the die was cast for me back in 1978, when Steve Goldin and I saw Animal House the night it opened at a theater in Princeton, NJ. I had seen comedies before, of course, but none that had ever worn me out. We laughed so hard at the antics of the Delta House gang that we went back again the next night. And quite a few more times after that. Saul Austerlitz would probably make the same choice, I’m guessing. He’s the author of a new movie history, Another Fine Mess: A History of American Film Comedy. It takes the genre from Charlie Chaplin—whose work I myself studied at the University of Florida many years ago — to Judd Apatow, whose work I now study from the comfortable of my family room, without the annoyance and interruption of pop quizzes and term papers. Austerlitz established his pop culture research credentials with a previous book, Money for Nothing: A History of the Music Video from the Beatles to the White Stripes.